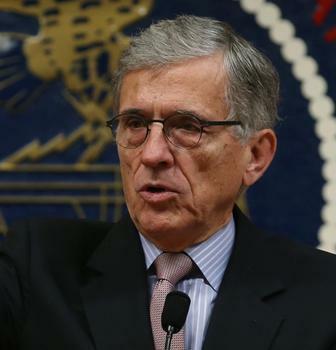 Federal Communications Commission Chairman Tom Wheeler will step down Jan. 20, he said today, clearing the way for Republicans to take control of the agency. “Serving as FCC Chairman during this period of historic technological change has been the greatest honor of my professional life. I am deeply grateful to the President for giving me this opportunity," Wheeler said. He credited the commission staff helping to create "a thriving communications sector, where robust investment and world-leading innovation continue to drive our economy and meaningful improvements in the lives of the American people." A former cable television executive and lobbyist, Wheeler pushed through "net neutrality" regulations which basically reclassified broadband service as a utility and required service providers to treat all traffic equally. He also enacted tough privacy restrictions for internet service providers and tried to break open the cable television's monopoly on set-top boxes, substituting a plan that would have provided a software solution for distribution of both cable and internet-streamed video services. Wheeler's "Unlock the Box" plan would have saved consumers an average $231 annually in sox rental fees and would have put internet streamed video on an even footing with cable bundles. "Apps will liberate consumers from set-top boxes: The new rules will require pay-TV providers to offer to consumers a free app, controlled by the pay-TV provider, to access all the programming they pay for on a variety of devices, including tablets, smartphones, gaming systems, streaming devices or smart TVs," Wheeler wrote in a newspaper op-ed describing his plan in September. But the cable and entertainment industries mounted a vigorous lobbying effort against the proposal and Wheeler simply ran out of time, the election of Donald Trump likely spelling the end of White House support for the idea. Wheeler's resignation gives Trump the opportunity to name a nominee to the five-member commission immediately. Assuming he nominates a Republican, the GOP will have a 3-2 majority on the commission and may revisit net neutrality and some of Wheeler's other programs.